Patrick Wang's striking directorial debut, In the Family, has perhaps one of the strangest and most unique release patterns of any film in the past year. Originally given a miniscule release in New York City in November of 2011, In the Family was barely noticed save for a few very passionate reviews. That prompted a slow, wider release that allowed the film to pick up an ever growing group of fans and supporters, leading to its triumphant return to New York's Cinema Village on November 16, more than a year after its initial release, now newly heralded by a much larger group of critics and audiences. The unusual release pattern, while demonstrating an exceptional faith in a film that is an admittedly difficult sell, has also put it in a strange limbo for critics just now coming to this brilliant film. While most people didn't discover it until 2012, and indeed it is one of 2012's most remarkable cinematic success stories, it is technically a 2011 release, and therefore ineligible for many year end top ten lists, something that no doubt would have helped it along the way. Joey (Patrick Wang) and Cody (Trevor St. John) in IN THE FAMILY. Courtesy of In the Family, LLC. Wang himself stars as Joey, an Asian gay man from Tennessee in a loving long term partnership with white high school teacher Cody (Trevor St. John). Together they are raising Cody's biological son, Chip. When Cody dies suddenly of an unexpected illness, Joey and Chip find themselves alone for the first time, trying to pick up the pieces of a shattered life. Things get complicated, however, when Joey discovers that Cody left sole custody of Chip to his sister, Sally, in a six year old will. Devastated, Joey is left to wonder what happened, and as he grows more and more estranged from a family that had once accepted him, he is left with nothing but his memories for company. When he decides to fight for his son, it becomes clear that even the law is against him. In a world that doesn't even recognize his relationship as legitimate, his entire family as he knows it is about to be torn apart. It's an especially timely film, as public opinion continues to shift in favor of gay marriage and becomes ever more accepting of gay families, most recently with the historic victory for gay marriage at the polls and the election of a president that publically supports it. But In the Family is not a political film. Quite the contrary, actually, it's almost anti-political. While it is set in Tennessee, and ignorant opinions clearly rear their ugly head during Joey's climactic deposition at the custody hearing (more out of lawyerly convenience than real hate, it would seem), the film deftly avoids politics by simply treating its characters as human beings. Wang clearly has the plight of gay families close to heart, but the fact that Joey is a homosexual almost seems like a non-issue. He is simply a father fighting for the custody of a son in a legal system that is woefully behind the times. Chip (Sebastian Brodziak) and Joey (Patrick Wang) in IN THE FAMILY. At nearly three hours long, In the Family may seem a bit daunting, and even self-indulgent for a first time writer/director. But the film never once feels like it's as long as it actually is. Wang never wastes a shot, and each moment is imbued with a kind of quiet dignity. It is a film made up of moments, and these are the moments make up a life. So often the film focuses on what may seem like trivialities, but these small moments create a big picture that is simply stunning. In the days following Cody's death, Wang spends quite a bit of time just observing Joey and Chip silently going through the motions of their life as if in a trance, lost without the missing piece of their family. It is as heartbreaking as it is riveting, and it never feels gratuitous. In the Family is an extraordinarily assured debut, both as a directorial achievement, and as a triumph of acting and writing for Wang. Joey's final deposition, shot in medium close-up in one marathon take, is simply stunning, made even more so by its hushed understatement. You'll find no over the top histrionics here, no shouting or crying or unnecessary melodrama, just a quiet sense of justice. It's so subtle that the final shot hits like a bomb. It is an emotionally shattering denouement to one of the year's most truly special debuts, heralding the arrival of a thrilling new cinematic voice. There's really nothing else quite like it, and as it continues its slow journey across the country, the number of hearts it has touched will only continue to grow. Make sure yours is one of them. 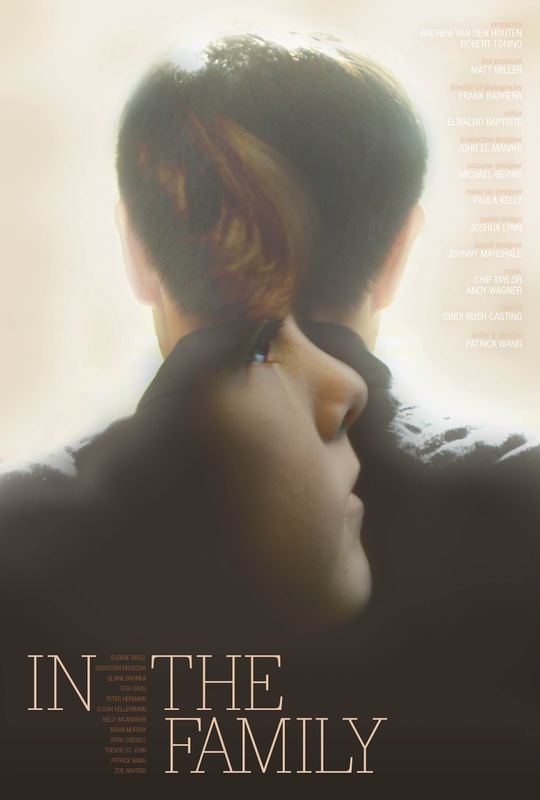 IN THE FAMILY | Directed by Patrick Wang | Stars Patrick Wang, Trevor St. John, Sebastian Brodziak, Park Overall, Brian Murray | Not rated | Now playing in select cities. You are a truly poor excuse for a reviewer. You totally have spoiled the film for anyone who took the time to read this article by revealing a major story plot! SHAME ON YOU! I'm not sure what plot point I revealed here that isn't a part of every synopsis of the film. Thanks for stopping by!